*Mayank Aggarwal will not play as he is playing for India-A Side. *Parikshith Shetty can be replaced by bowling allrounder A Sakuja, Anil IG or batsmen S Jain. *M Taha, A Reddy, S Gowda, P Dubey and V Kumar will be the key players with bat. *Captain Vinay Kumar Will be crucial both with bat and ball for the team success. *P Dubey and Mahesh Patel will lead the spin attack. *Vinay Kumar, S Seshadri, Darshan MB and Kranti Kumar will be the main pacers. *Mahesh Patel is in good form taking seven wickets in three matches. 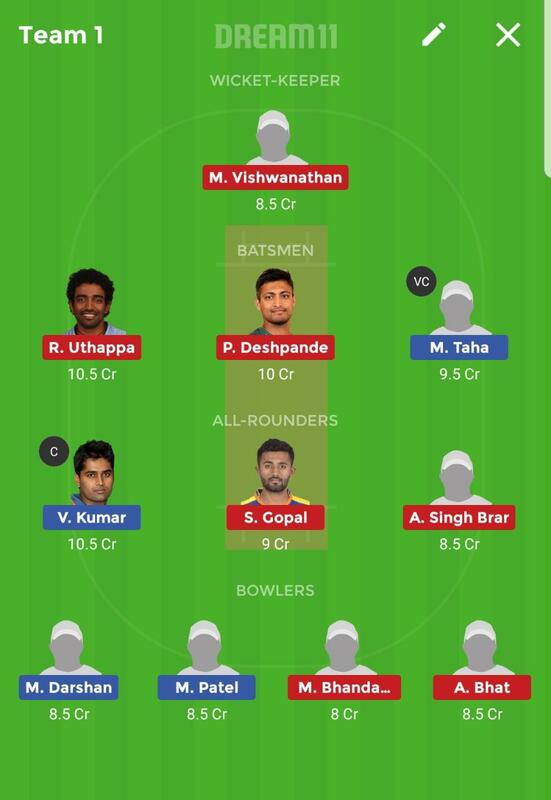 *Shreyas Gopal and Prasidh Krishna are available for selection. *R Uthappa, P Deshpande, M Vishwanathan and KB Pawan will be the key batsmen. *A Brar, A Bhat and B Devaraj will play role of finisher for the team. *A Doddamani, M Yadav, B Devaraj will lead the spin attack along with A Brar. *M Bhandage, A Bhat and V Koushik will be the main paceqrs. All are in good form.